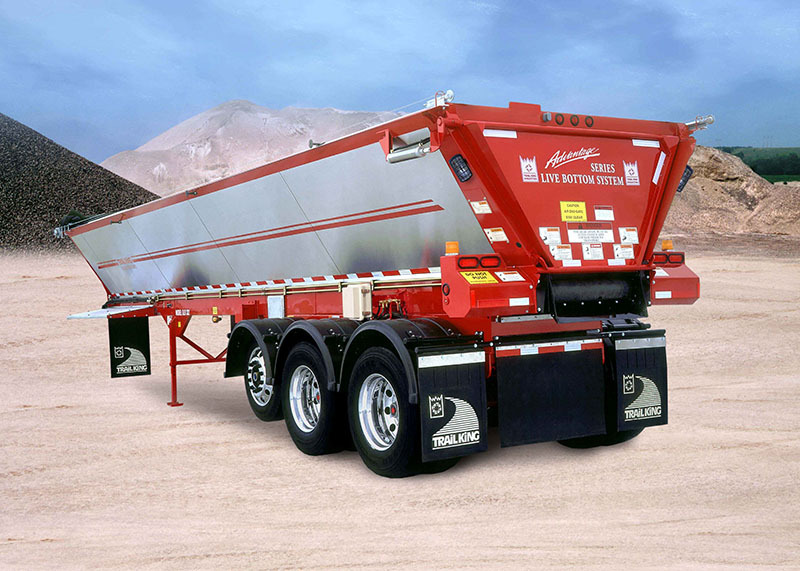 Live Bottom Dump Trailer - Kingpin Trailers LTD. The Advantage Series Over-The-Fifth-Wheel Live Bottom (OLB) incorporates lightweight, smooth aluminum sheeting and a re-engineered frame into a new lower, lighter, more aerodynamic and fuel-efficient design. 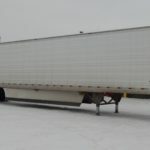 And, by lowering the overall height of the trailer and extending the hopper two feet forward, we’ve improved the load distribution and lowered the payload center of gravity for more load-handling stability. Other features include 36″ belt width patented floor system, and self-lubricating chain oiler system. The Trail King Advantage Series OLB… destined to be the best live bottom you’ll ever own. (60′) reduce segregation of loads during transport and eliminate bridging problems. 96″ hopper width standard (102″ option). (optional) also available with air-lift axles. Three-leaf suspension is standard. 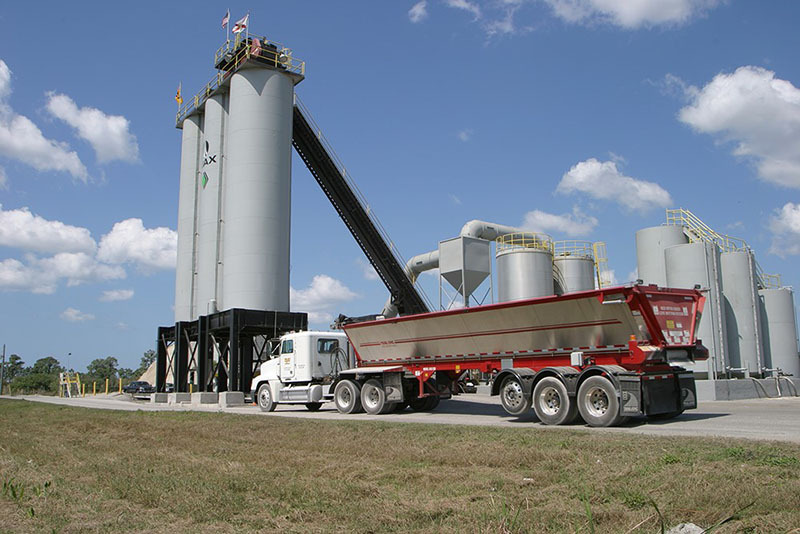 asphalt and asphalt-related materials – one trailer serves many needs. (optional) are available with a manual or electric drive. with double-reduction planetary gearbox eliminates the problems associated with chain drives. in one revolution or less makes unloading easy and reduces cycle time. new convenient hinged design for better paver hopper clearance. 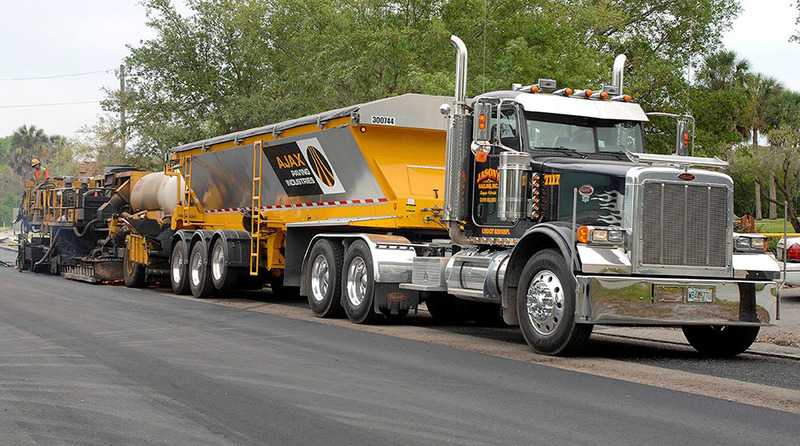 of heat-and oil-resistant two-ply rubber moves entire load to the rear for discharge. 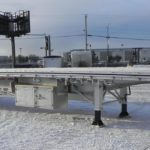 The 36″ belt is attached to steel slats and moved by double pitch roller chain on steel tracks. with easy access chain oiler system. distributes weight over the entire length of the tractor and trailer, including the steer axle, for maximum payloads within legal limits. Coupled with short wheelbase tractors, these combinations can be highly maneuverable. Empty weight ±3% 13,350 lbs. 15,390 lbs. 14,900 lbs. 13,850 lbs. 14,980 lbs. 15,900 lbs.